It sounds okay and the drum machine is a bonus, but it's too basic to wear the 'pro' badge. Versatile soundset. Tough and portable. Not as many features as we'd hoped for. There are eight tough rubber pads on offer here. Sadly, samples can't be loaded to the Performance Pad Pro. 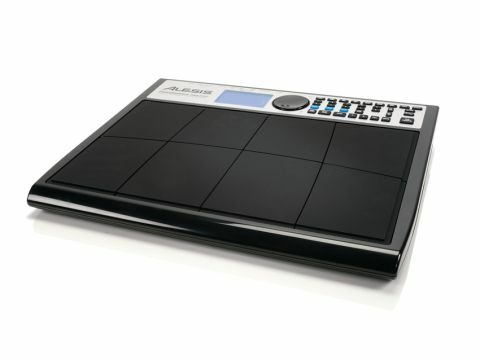 When we reviewed the original Performance Pad in 2008, its dated sound engine was based on the 20-year-old Alesis SR16. Its stunted MIDI features and basic feature set, too, just couldn't compete with a pad controller plus DAW software such as BFD. But has this new model quashed those issues? "As a drum machine its feature set is good, though still quite basic." For starters, the redesigned hardware looks and feels much better. The bright blue screen is clear, the tough rubber pads feel nice to play (though some included sticks would have been nice) and navigating the interface is simple. However, only eight levels of velocity is limiting and though Alesis make a lot of the 'dynamic articulation' feature, the sounds aren't that expressive across the velocity or tonal range. The soundset (taken from the SR18) is versatile and sounds good. There are now 500 sounds onboard compared to 120 on the old Performance Pad and polyphony has been doubled to 32 notes to accomodate the three types of sound available (drumset, percussion and bass) plus there are now 100 preset and 100 user drum machine patterns onboard, though it's a shame they can't all be overwritten especially as most people don't just want to use preset beats, as good as they are here. Thankfully the samples are punchy, cover a lot of stylistic bases and the effects - reverb, EQ, compression - while not the greatest, are useful enough. There are basic controls for amp envelopes - though attack and release only work on the bass sounds - plus tuning, ﬁlter and panning, but it's still very limited compared to what's achievable with a laptop plus drum/percussion sample library and a USB/MIDI controller pad. The addition of bass sounds is welcome and there's a small range of acoustic, electric and synth tones onboard. Unfortunately, as there are only eight pads, each bass kit can access only eight pitches at a time and the sounds within a kit can't be individually pitched to form custom user scales, limiting its usefulness. This is compounded by the lack of a MIDI input or USB, so there's no way to access the onboard sounds externally, though the Performance Pad Pro works well as a very basic MIDI controller. There's also an audio input for practicing along with your beats. As a drum machine its feature set is good, though still quite basic for a 'pro' model. There's straightforward pattern/loop recording with real-time overdubbing, quantising, step editing and pattern chaining and the sequencer swings nicely and is super-tight, so no complaints there. Each pattern also has A and B parts plus two ﬁll parts too, though we were expecting multiple sequencer tracks like on the Akai MPC, yet there's only three tracks per pattern-drums, percussion and bass. In the end, the Performance Pad Pro still has one too many deﬁciencies for it to wear the 'pro' badge. Yes it sounds good, it's portable, self-contained and easy to use as a basic drum machine or for live percussion/ drumming but the lack of a MIDI in, no USB and no sample loading ability, plus the limited number of sequencer tracks and limited bass notes available via the pads is frustrating. Perhaps the redeeming thing is that it's fairly cheap compared to other percussion pads with drum machines, but that shows in its feature set. In general, it's not well specced enough as a drum machine or as a percussion controller to really impress.